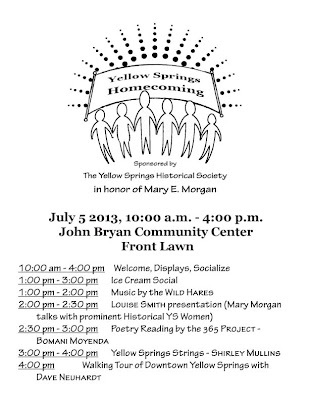 Although the word “homecoming” usually bring to mind football, the Yellow Springs Homecoming is an invitation to anyone who has attended school in, resided in or in any other way considered Yellow Springs “home” to gather together starting at 10:00 am on Friday, July 5, on the front lawn of the John Bryan Community Center for sharing fun and memories (including football players). When Mary Morgan and her family came to Yellow Springs in 1951, they adopted the village as their own. Forty years later she led the creation of the Yellow Springs Homecoming in 1991, a celebration of a community reunited on the Fourth of July, bringing together Yellow Springs residents past and present, not to mention events of local and national significance. Put on by the Yellow Springs Historical Society, the original Homecoming lasted for three days, featuring music, food, theater, and dancing, most of it held on Mills Lawn, where the home of William Mills, who laid out the town as we know it, once stood. 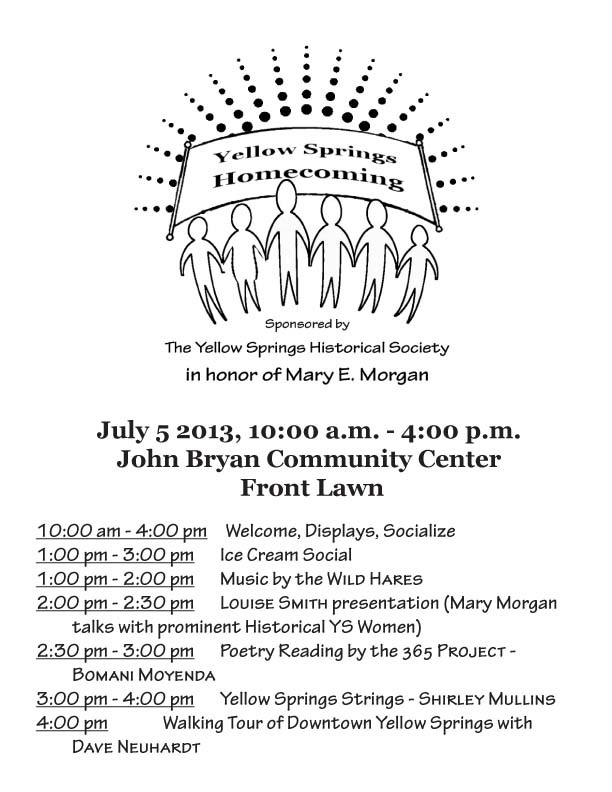 This year, on July the 5th, the Historical Society puts the Yellow Springs Homecoming on again, this time to honor Mary’s outstanding contributions to and boundless enthusiasm for both the village she adopted so long ago and the Society, to which she devoted so much time and energy, conferring upon it a direction and a spirit that continues to this day. A list of scheduled events can be downloaded from the 2013 schedule page of the Yellow Springs Historical Society website. Bench to Nowhere: Everybody outta da water! Camp it up with YSKP!